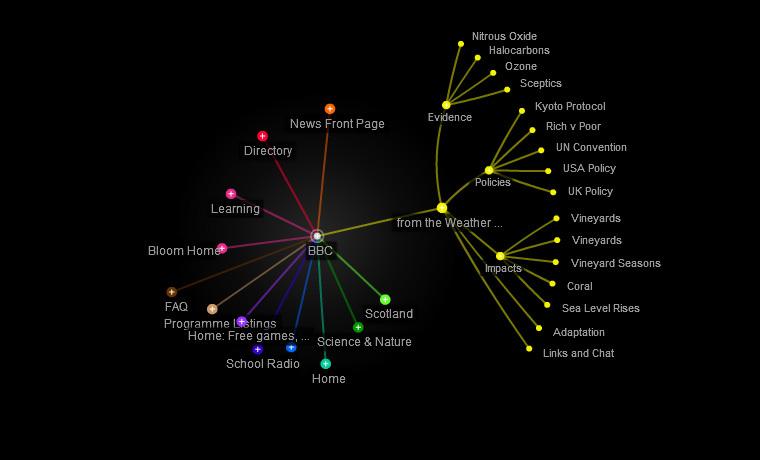 Normally the BBC website allows you to search for information using a search tool similar to google which would give you a list of results on a page. 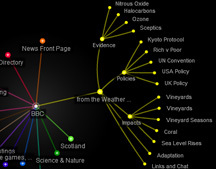 SearchWeb lets you look for content on the BBC website by inputting search terms and generating a tree of information containing links to web pages with the BBC homepage at its centre. 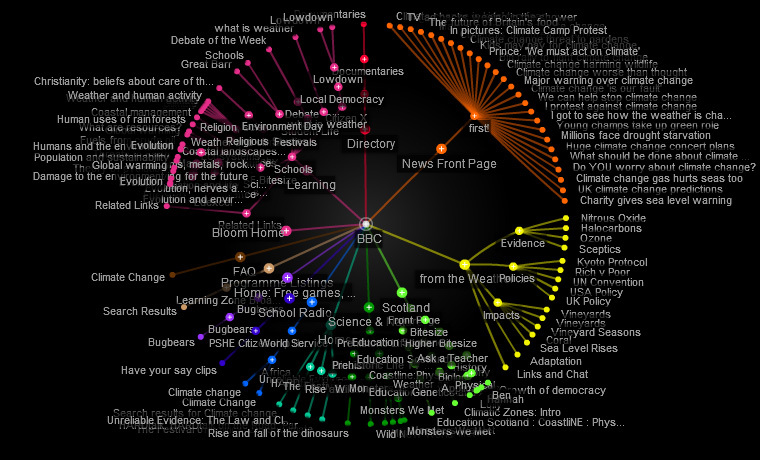 Displaying web pages visually allows an “at a glance” overview of a large number pages and content areas on the BBC website in a way that enables a quick understanding of connections between topics. 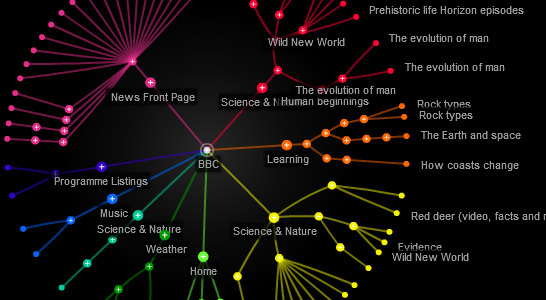 You can then navigate the tree structure and follow specific topics by launching the web page associated with it. 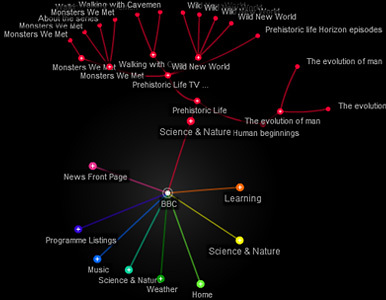 Different content areas are indicated by different coloured branches. 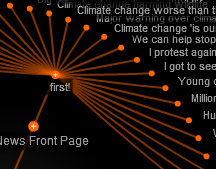 In addition to topic navigation, SearchWeb displays all the tags that relate to a search term. 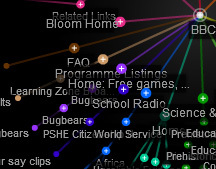 “Tags” being, extra information or “hints” associated with the topic that the web page sends to SearchWeb. 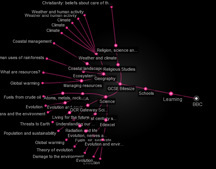 For example, if I search for “climate” the tags list on the right hand side of the visualisation will also give me a list of subjects that I might also be interested in such as “biodiversity”. 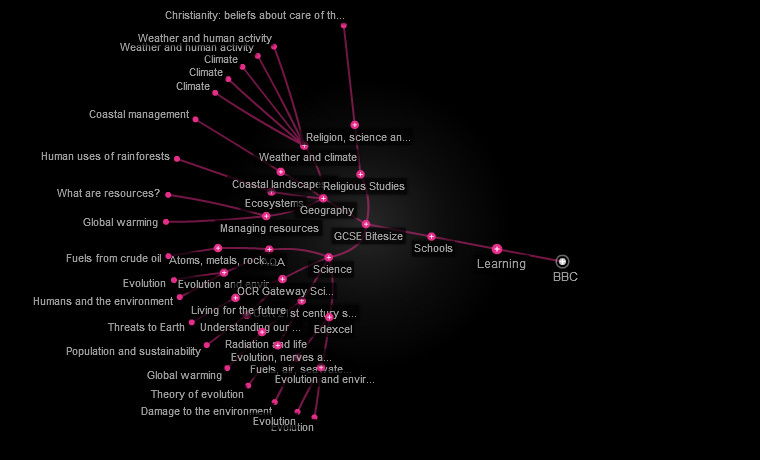 This tagging system relates to another Learning Development project "Taxonomer", which maps BBC content as a semantic web. 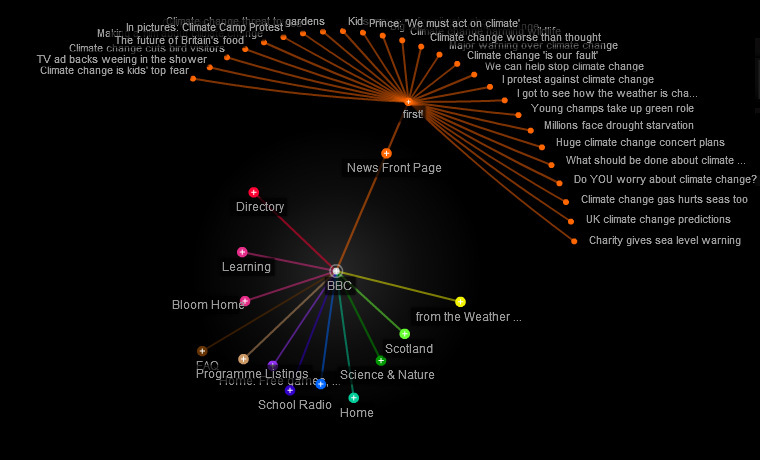 SearchWeb is available immediately for use, either dive straight in or follow the instructions below. You must have Adobe Flash player installed to use the project, it can be downloaded here. Launch the application using the red button above. When entering a search term the dropdown list displays valid search terms. (Not all of these currently function). Run a search using a tag name by clicking the magnifier button to the right of a tag.